beautiful kits you got there, mate. but is it for someone else or you request for kits? you want logo on both kits? ok can you give me picture of badge and sponsor please! and you want different puma, hummel and adidas yeah? is it fantasy or real? better if you tell me what type of kits, and nike? adidas? etc. can help me. see first post ...like this...can help us! why other fantasy kit? 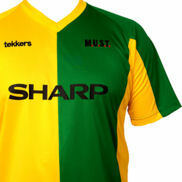 you have man utd fantasy kit! This one ain't for me. its 4 a m8 who has shaktar game. Don't worry bout it. He should be ok.
FBKits - the best style !